Multi-stock scan: enter or import in a list of stocks and Optionstar will recommend the best spreads for each stock based on volatility, theoretical price, time value or decay. Scan a stock list for the best covered calls, naked puts, and credit debit spreads. Implied Volatility and Trend analysis for the entire stock list. American option valuation formulas available based on the binomial equation. Thorough Option chain analysis: all greeks, and probability of profit. Spreads categorized by: debit credits, moderate bull/bears, straddle / strangles, neutral and volatiles, ratios, and miscellaneous. Sort spreads by best: cost, max risk/rew, prob of profit, expected return, and profit area. PL graphs displayed for along with historical price and profit zone graphs. 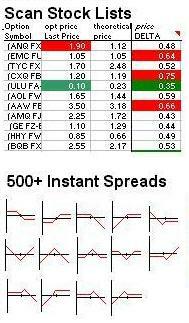 Exotic spreads such as christmas calls/puts, upstairs, downstairs, and collars. Copyright 2002 Star Research, Inc.